There's an interesting discussion going on in the Apache mailing lists about legal rights versus social rights. Here's a representative message, from Roy Fielding. There is no code in the universe that is worth any further discussion once it has been poisoned by ill will. Just cut the dead limbs and let the rest of the plant grow itself. Java 7 was released today ... did you even notice? Is this the quietest and least-remarked-upon release of Java that has ever occurred? Google News says "Results 1-2 of about 2 related articles." It would appear that automated translation is making progress, but is not quite perfect yet. Dana MacKenzie explores a particularly delightful example. When time permits, I try to read Fred Wilson's essays, particularly his well-known and well-respected "MBA Mondays" series. I'm not a finance guy by profession nor by aspiration, and much of it goes over my head, yet slowly but surely I'm learning more about VC financial operations work. So I was pleased recently to see that Brad Feld, who is a very interesting VC blogger himself, is embarking on a similar series, which he calls "Finance Fridays". So there you go! You can now book-end your work week by learning a little bit of finance to start and end each week! Jennifer Pharr Davis, a speed hiker who lives in North Carolina, is engaged in a speed hike of the entire Appalachian Trail this summer, from Mount Katahdin in Maine to Springer Mountain in Georgia. In order to achieve her goal, she has to cover 48 miles on average each day, hiking 17 hours a day; her support team meets her at ponts where the trail crosses roads in order to deliver a nearly-constant supply of nutrition. Asked about the upside of hiking all day, Pharr Davis did not hesitate. "Animals!" she cried out. "Any time I've seen a moose or a bear, it's like taking a little energy pill," she said. I know that thrill, though I've never seen a moose in the wild, and only a handful of bear experiences in 3 decades. I saw my first wild fox this month, though! Here's an intriguing story about a young woman from San Francisco's extremely impoverished Bayview neighborhood whose chess-playing talent has been recognized by the Susan Polgar Foundation. The team at NPR's Planet Money / This American Life programs dig deeply into the world of software patents. So we went to Marshall. The door to Oasis's office was locked, and through the crack under the door we could see there were no lights were on inside. It's kind of a cliche to knock on the door of the empty office. But we'd flown a long way. So we knocked. No one answered. The office was in a corridor where all the other doors looked exactly the same —locked, nameplates over the door, no light coming out. It was a corridor of silent, empty offices with names like "Software Rights Archive," and "Bulletproof Technology of Texas." It turns out a lot of those companies in that corridor, maybe every single one of them, is doing exactly what Oasis Research is doing. They appear to have no employees. They are not coming up with new inventions. The companies are in Marshall, Texas because they are filing lawsuits for patent infringement. Patent lawsuits are big business in Marshall, which is part of the eastern district of Texas. Many people say that juries in Marshall are friendly to patent owners trying to get a large verdict. A local lawyer who has argued on both sides of numerous patent cases says it's actually because cases go to trial more quickly in Marshall than in other places. In any case, thousands of lawsuits are filed there, claiming that there's an inventor whose invention is being used without permission. But there are no inventors in Marshall, just corridors of empty offices. It's a great article, and the team from NPR did great reporting work to bring it all together. You should read the whole thing (or listen to the NPR episode on the radio). PCWorld carries an extensive report on yesterday's hearing in San Francisco Federal District Court regarding the Oracle v Google patent lawsuit over Java/Android. "There's nothing in there but a guy who's being paid $700 an hour who comes up with $6 billion. Come on," Alsup said. "You lawyers are not going to handcuff the public from knowing what goes on in this federal district court," he snapped. "This is not a wholly-owned subsidiary of Oracle Corporation. " It's fascinating stuff; the issues are clearly coming to a head now. Florian Mueller, as always, has more, including links to half-a-dozen other press reports from journalists who attended the hearing. Recently, I've been reading Eli Pariser's new book: The Filter Bubble: What the Internet is Hiding From You. The title is a bit awkward; the topic of the book is personalization on the Internet and its effects. Personalization is the technique in which Internet web servers keep track of who their users are, and what information is available about them, and use that information to customize themselves, adapting their responses based on who is making the request. When you search for the flight, Kayak places a cookie on your computer -- a small file that's basically like putting a sticky note on your forehead saying "Tell me about cheap bicoastal fares." Kayak can then sell that piece of data to a company like Acxiom or its rival Blue-Kai, which auctions it off to the company with the highest bid -- in this case, probably a major airline like United. Once it knows what kind of trip you're interested in, United can show you ads for relevant flights -- not just on Kayak's site, but on literally almost any Web site you visit across the Internet. This whole process -- from the collection of your data to the sale to United -- takes under a second. Why is this something you should worry about? Well, it's not terribly easy to explain, but Pariser tries, presenting several interesting perspectives on why there are downsides to having your computers conform too subserviently to your desires. in moments of major change, when our whole way of looking at the world shifts and recalibrates, serendipity is often at work. "Blind discovery is a necessary condition for scientific revolution," they write, for a simple reason: The Einsteins and Copernicuses and Pasteurs of the world often have no idea what they're looking for. The biggest breakthroughs are sometimes the ones that we least expect. The personality traits that serve us well when we're at dinner with our family might get in the way when we're in a dispute with a passenger on the train or trying to finish a report at work. The plasticity of the self allows for social situations that would be impossible or intolerable if we always behaved exactly the same way. We live in an increasingly algorithmic society, where our public functions, from police databases to energy grids to schools, run on code. We need to recognize that societal values about justice, freedom, and opportunity are embedded in how code is written and what it solves for. Once we understand that, we can begin to figure out which variables we care about and imagine how we might solve for something different. Pariser's book covers a number of important issues of the moment. This is not to say it's a perfect book, unfortunately. Like all too many popular non-fiction books, it stretches out the page count with wordy text and filler; I felt like this was a great 30-page essay that became a 200 page book. Pariser is a skilled writer and the book reads well; you'll move through it in a few days. And you'll learn a lot and you'll look at the Internet with a new eye, so these are good outcomes and good reasons to spend your time with this book. I've reached Project Euler level 2, which means that I've correctly solved 50 of the 344 problems currently available on the site. The problems are definitely getting harder. The New York Times is running a fairly disturbing report about the details of some of the forensic software which was used as "evidence" in the Casey Anthony trial. I didn't pay much attention to the trial at the time, as it was too much a circus; now I see to my dismay that it was indeed a circus and that poor handling of software played a significant role in that. The Orange County Sheriff’s Office had used the software to validate its finding that Ms. Anthony had searched for information about chloroform 84 times, a conclusion that Mr. Bradley says turned out to be wrong. Soon after giving testimony, Mr. Bradley learned during the defense portion of the case that the police had written a first report in August 2008 detailing Ms. Anthony’s history of Internet searches. That report used NetAnalysis, a different software. I'm pleased to see the NYT taking the effort to follow-up on the case and pursue important details like this. People in the law enforcement community ought to care about thoroughness and accuracy; as a society, we delegate extremely important decisions to them and they need to understand the importance of that trust that they carry. I loved today's episode of Tom Hilton's republication of the Whitney Survey -- it is so colorful and evocative! The place was dirty enough—dry, dusty sand, which hot gusts of wind at times blew into our eyes and mouths—there was neither cleanliness nor comfort in taking our meals and the water was very nauseous. Hilton's work has been wonderful; if you aren't following each day of the survey's trip through central California you're missing a great treat! Cool result: a team built a program that could learn to play FreeCiv by reading the manual, and it actually works! "It’s not like Android’s free. Android has a patent fee. You do have to license patents," Microsoft CEO Steve Ballmer said last year. What he didn't explicitly say is that you'd have to pay Microsoft and not Google for those patents. Think about this for a second: it's entirely possible that Microsoft is going to end up making more money — perhaps significantly more — from Android than Google will. A year ago, such a statement would have seemed like a joke. But now it’s becoming reality. U.S. patent law creates disincentives for searching through patents, even though one of the main justifications given for the patent system is that the patent teaches the public how to practice an invention that might otherwise be secret. Willful infringement subjects the infringer to enhanced damages when they are aware of the patent and intend to infringe, and reading patents increases the probability that subsequent infringement will be found to be willful. disclose the operation of processes, including user mode kernels, which have no relationship to, nor disclose in any way, "to obtain a representation of at least one class from a source definition provided as object-oriented program code." As far as I can tell with my bloodied-forehead inadequate-legal-training mind, Oracle is saying that even though copy-on-write has been a well-known technique for 40 years, since the original descriptions did not describe how to use it with Java class files (which of course weren't even invented until 25 years later), Oracle deserve patent protection for inventing the idea of doing copy-on-write for Java class files. This is just completely absurd. The whole idea of computer science, indeed the whole idea of any science whatsoever, is that when there is a basic, general, abstract notion, such as "copy-on-write", subsequent work involves taking that notion and applying it in specific to concrete situations where it may arise. This does not constitute innovation; it constitutes the basic application of human reasoning. Has the patent system adapted to software patents so as to overcome initial problems of too littlebenefit for the software industry and too much litigation? The evidence makes it hard to conclude that these problems have been resolved. It is possible, of course, that software patents might be highly beneficial to the various hardware industries that obtain large numbers of software patents. Clearly software patents are privately beneficial in these industries – that is why firms acquire so many of them. However, this does not mean that there are corresponding social benefits. For example, this patenting might be aimed at building large strategic portfolios that facilitate business stealing without increasing the level of innovation. Only further study can tell. Nevertheless, if software patents were socially beneficial, this should show up in the evidence from the software industry. In this regard, it is notable that after more than a decade of experience, this economic experiment played out in a highly innovative industry still lacks clear evidence of net benefit. In particular, this invention recognizes that computer data may contain structures, for example, phone numbers, post-office addresses, and dates, and performs related actions with that data. The '647 patent accomplishes this by identifying the structure, associating candidate actions to the structures, enabling selections of an action, and automatically performing the selected action on the structure. For instance, the system may receive data that includes a phone number, highlight it for a user, and then, in response to a user's interaction with the highlighted text, offer the user the choice of making a phone call to the number. It is not just amazing to hear that Apple claim they invented this concept in 1996; it is still more amazing to hear that the U.S. Patent Office agreed that Apple invented this dead-simple concept, granting them a patent on it, and amazing beyond any comprehension that this ITC organization studied the problem again and still felt it was an innovation that needed protection. This technique (recognizing data types by patterns in their structure) is decades, maybe hundreds of years old. Personally, I can distinctly remember being educated, in the early 1980's, about how libraries and publishers across the world identified each book in existence using the International Standard Book Number, a system designed in the mid-1960's. The wonderful thing about ISBN's, of course, is that they can be recognized from their structure, and software can then locate those numbers and present them appropriately to the user, providing special operations that the user can then request on them. We built this functionality into the online library catalog in, if I recall correctly, 1982. But this is certainly nothing new, either, for postal codes, Social Security Numbers, telephone numbers, and so forth have been recognizable from their structure for many decades, if not more. German postal codes were in use before the second world war, but Germany's postal system and their techniques for identifying and routing mail date back to the early 1800's. I love this short essay by Doc Searls illustrating how the Web is moving in exactly the wrong direction. Google Maps tells us little about the location, but plenty about the commercial establishments there. You know those hotel maps they give away, that only show hotels? It’s like that, only worse. The hotel maps at least give you some street names. As our libraries disappear, as our newspapers and magazines vanish, and as the state of the art in technology seems to spend more and more of its effort on incremental improvements in advertising technique, kudos to Doc Searls, Brewster Kahle, and others like them for continuing to remind us that we are more than merely consumers. I recently came across a short article by Derek Jones of Knosoft, Ltd, and from there I followed a few pointers to arrive at this astonishingly encyclopedic ebook about the C Programming Language. It appears that Jones also maintains an intriguing blog, and has written some other shorter papers and articles. I suppose I'll probably start by reading some of the shorter, more approachable works, and perhaps over time I'll work my way up to diving into the book itself, maybe by skimming through the table of contents looking for topics of particular interest. Home movie of the hatbox ghost! You probably didn't even know that the Disney History Institute had a web site, but they do, and if you go there, you can watch this movie! My first visit to Disneyland, by the way, was 10 full months later, in late June 1970, so I have no evidence regarding this particular topic. On a one-night weekend trip to Bodega Bay, we saw: deer, a fox (! 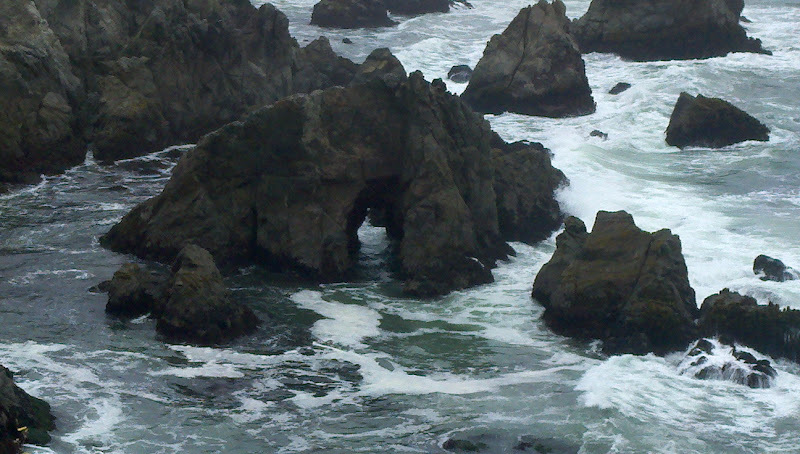 ), whales off Bodega Head (!! ), hawks, and a dozen white pelicans fishing in the harbor. At IGN.com, Andrew McMillen has published a long and detailed examination of the various labor relations issues behind the mega-hit game of the year, L.A. Noire. There are allegations of abuse, arguments over credit, tales of high emotion and conflict. It's juicy stuff, just like reading the latest issue of Entertainment Weekly ... well, d'oh! The games industry is the entertainment industry, nowadays, and an expose like this just fits right in. Looking back, what would he have done differently? "I think we'd think twice about Sydney, wouldn't we?" McNamara asked Vicky Lord, Bondi's general manager, who was within earshot throughout our 50 minute interview. "There's not that much government assistance, compared to Canada or the U.S.," he says. "The expectation is slightly weird here, that you can do this stuff without killing yourself; well, you can't, whether it's in London or New York or wherever; you're competing against the best people in the world at what they do, and you just have to be prepared to do what you have to do to compete against those people. The expectation is slightly different." "And the people who're making [this game], their experience [with other Australian game development companies] has generally been work-for-hire, which is a lower level of expectation in terms of quality than what we would expect, with Sony in London and all that kind of stuff. So that's been the hardest [part], but having said that, have we got great people here? We have," he concludes. "We've got some people who started as kids, and have since become great men and women. We're really proud to work with them." So, although McMillen's article reads a bit like a breathy Hollywood gossip rag, dig into it and give it a try. This is one of the most important industries of our generation, with its issues and topics worthy of consideration by the Supreme Court, and you're not wasting your time learning more about how it ticks. How do you feel about the Long Now clock? I'm uncertain about how I feel about the Long Now clock. I've read Kevin Kelley's The Clock in the Mountain, and I've read Dylan Tweney's paean in Wired: How to Make a Clock Run for 10,000 Years. At some level, it's interesting stuff: lubricants accumulate grit, so it's better to use non-lubricating ceramics; drill the hole from the bottom up, but the robotic stair-cutting machine will etch the stairs from the top down; something about stainless steel Geneva wheels; pictures of Stewart Brand in long robes like some medieval monk. The foundation plans to make the designs for the clock open source, so eventually you'll be able to download plans and schematics to build your own. What? Cast my own Geneva wheels in stainless steel? Drill a 12-foot diameter hole in my own private mountain? [Tweney asks] Bezos how he can justify spending so much money on a project that seems so, well, impractical. But there's a second reason, he says: It's nonredundant. Bill Gates is funding malaria research and education, George Soros promotes human rights around the globe. Warren Buffett gives to reproductive health, family planning, and antinuclear causes. But no other billionaire is building a clock like this, for the sole purpose of changing humanity's relationship to time. [Tweney asks] how he can justify spending time on the clock instead of, say, Applied Proteomics, which is helping fight cancer. "I think this is the most important thing I can work on. More than cancer. Over the long run, I think this will make more difference to more people," he says. How do you become one of those time-conscious beings who visit and wind the Clock? Jeff Bezos has just launched a public web site, 10000-year-clock, where interested folks can register their desire to visit the Clock in the Mountain when it is finished many years from now. Bezos has said he will give some kind of preference to current members of the Long Now Foundation. Hillis, Brand, Bezos: these men should have been my heros. They are educated, powerful, successful, interested in the potential of technology to solve the problems of humanity. They name-drop the names of other similar men (Gates, Buffett) who truly are deserving of respect and admiration. But name-dropping and being rich and eccentric doesn't make you deserving of respect in this day and age. Felix Salmon provides a nice short summary of the current state of the Skype/SilverLake options claw-back mess, and in the process does an excellent job of explaining why Steven Davidoff completely missed the point. The Sunday New York Times includes a short article about office space activity in San Francisco proper, where both Twitter and Salesforce.com, each recently wooed aggressively by the city, are readying their new offices. Twitter is renovating and occupying the space once known as the Furniture Mart, "on a particularly desolate section of Market Street". Salesforce.com is building an eight building campus in the Mission Bay neighborhood, which has been moving upscale dramatically since the University of California San Francisco built their medical center there. The article asks the question: "what happens ... when the culture of the suburban campus drops into an urban center?" and worries, based on some evidence, that "the area remained sterile and empty. Employees drive in ... then drive out. The public stays away." Dropbox have clarified their licensing terms, attracting a lot of attention from users, some of whom are very concerned. The Dropbox blog post notes that this issue is both important, and hard: "We think it’s really important that you understand the license ... but copyright law is complicated". The question of interest is: does it matter, or does it not matter, that they say "to the extent reasonably necessary for the Service"? The Mt. Gox support blog issued a fairly detailed description of the Bitcoin "flash crash" and how it happened. Fake coins were issued to (briefly) drive down the price, allowing the attacker to make a purchase of some number of real coins. Thank you Mt. Gox for being open with the information, it was interesting to read. Meanwhile, Ben Laurie, who knows a lot about security, has published a paper about some of his thoughts about Bitcoin. The folks at Kaspersky Labs have published a thorough and detailed examination of what is currently known about TDL-4, the extremely sophisticated malware that appears to be spreading rapidly and creating a massive new botnet. Lastly on my random weekend list, here's an interesting short article about using git as a database. I'm a database guy at heart, and of course at my day job my work involves extending and enhancing our version control software, so I'm quite aware of the overlap and similarity between database systems, document storage software, and version control systems. They're all interesting and powerful types of systems software, and it's always interesting to consider the interactions and overlaps and comparisons between them. Mireille Silcoff's marvelous essay in this week's New York Times Magazine is superb! Run, don't walk, to your browser and carve out 5 minutes; it will be the best 5 minutes you've spent in a long time. I'd laugh, while my heart churned bitterly. It's not funny. This is a man's lifeline. He was born in 1908. He is my hero. Mireille, you are now my hero, too. Indeed, "nothing in the bloody place is functioning as it should anymore," but you are so right! Let us sing Huzzah! for the "sharp, virile 30-year-old fellow trapped in the body of a centenarian." Thanks so much for the sweet, heart-felt essay.